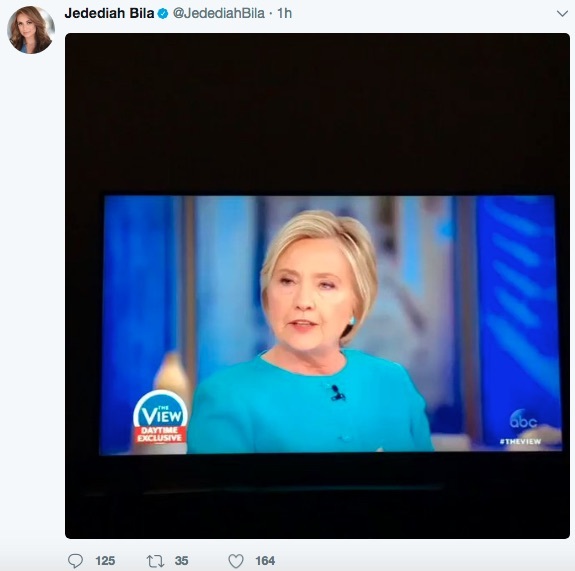 Outgoing "The View" host Jedidiah Bila appeared to give a winking nod to a report that she left the show after being criticized for pointedly questioning Hillary Clinton. "If I'm being honest with you, I felt there was some tone-deafness," she said of Clinton's post-election tome What Happened last week. "It hasn't just been Republicans who have taken issue with the writing of this book," Bila said to Clinton at another point. "Some Democrats have come out as well, former campaign surrogates of yours, former fundraisers." The New York Post‘s gossip site Page Six reported Monday that Bila, the show's sole conservative host, was told by staff to scale back her criticism of the former Democratic presidential candidate in hopes of having Clinton back on the show. "There was a lot of staff who were upset about how that interview was handled," Page Six quotes an anonymous source as saying. "They had a lot to say to Jedediah about calming things down." According to the Post, the request made Bila "uncomfortable" and she left the show despite still being partway through a season contract. Ten minutes after the piece went live, Bila tweeted out video of the exchange that reportedly led her to leave the show. Many observers took the tweet, which was soon deleted, as a subtle acknowledgement of the allegations in the Post piece. UPDATED 3:32 P.M.: This post was updated to note that Bila deleted her tweet and to replace it with a screenshot. This entry was posted in Politics and tagged Hillary Clinton, Jedidiah Bila, The View. Bookmark the permalink.